Tag Archive | "emergency room"
Over the weekend, I had a nostalgic experience. 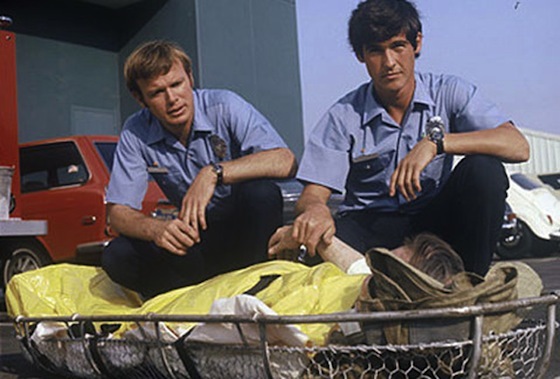 I happened to catch a little bit of an episode of Emergency!, the 1970s era television program that was the first to chronicle the exploits of two paramedics and a hospital’s emergency room staff. Little did I realize that, just two days later, I would find myself in the position of the show’s protagonists. As the end of a typical Monday at my office approached, I received a call on my mobile phone. A friend who was scheduled to have minor surgery on Tuesday was at his surgeon’s office, and his blood pressure was off the charts. I was summoned to the office to help convince my friend to go to the hospital for evaluation and treatment. By the time I arrived, my friend had already decided to go to the local hospital’s emergency room but had refused to be transported by ambulance. And so, like paramedics Gage and DeSoto in Emergency!, I was to convey the patient to the ER. Upon arrival, I pulled directly up to the ER’s door flashers blazing, helped the patient out of my vehicle, and wheeled him into the waiting area and spoke with the receptionist and ultimately, the triage nurse. This was the point at which the similarity of my actions to those of the television show’s cast members ended. With the patient settled, I went out to my car and, with no spaces available in the tiny emergency parking lot, drove the fifty yards or so to the hospital’s multi-level parking garage where I pulled into one of the spots designated for emergency room visitors. Following the instructions on the sign in the parking area, I reported to the security officer upon my reentry to the ER waiting area. He asked for the ticket that I was issued at the parking facility and stamped the back. I did not take a closer look at the ticket until later in the evening when I was leaving the hospital. When I did look at the stamped ticket, I was taken by surprise. Instead of what I had assumed was a validated parking pass, the stamp on the ticket I was holding indicated that I would receive a “reduced rate” for parking. So, instead of paying $4 for up to five hours in the parking facility, I was to pay just $2. It is said that “no good deed goes unpunished.” As I was thanking God for the fact that my Samaritan act in bringing a sick friend to the hospital was rewarded with a “reduced parking fee” (all sarcasm intended), I was struck by a thought: I had delivered the hospital a customer representing thousands of dollars in revenue to the facility! Rather than being charged for parking, should I not be compensated with a finder’s fee or commission for the “sale” the hospital’s staff “closed” upon the admission of this new “customer” into their facility? I now have another thought. When my friend receives his statement from the hospital indicating what his insurance paid and what he will, no doubt, owe, I plan on preparing and submitting my own bill to the hospital for 10% of their total charges, plus the $2 parking fee I paid. And, if any of you thinks that my bill to the hospital has even the remotest chance of being paid, I have this bridge for sale.